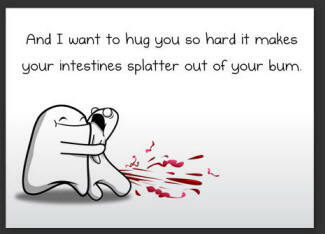 "And I want to hug you so hard it makes your intestines splatter out of your bum." Another effect of screen violence on children -- and, for that matter, adults -- is that they become more desensitized to violence and less outraged by its effects. Callousness toward brutality sets in and a "so what?" attitude begins to frame the context by which horrific acts are seen. Consequently, more justification for violence takes place in the minds of these individuals. Images of violence as "cool" serve to reinforce deviant attitudes and result in less empathy, compassion, and understanding for human suffering.